Assorted Pin Type Scroll Blades, 6 pc. Grizzly H9032 - Assorted Pin Type Scroll Blades, 6 pc. 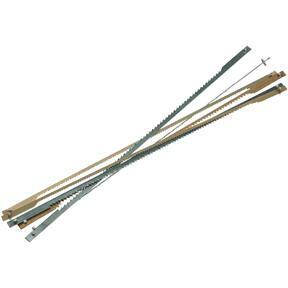 SuperCut Pinned End Scroll Saw Blades are best quality, hard tooth blades designed for saws that require 5 inch (pin to pin) blades. Always have the right blade on hand for the job with this 6 pack assortment. These pin type blades are getting hard to find, the newer machines using the pinless type. The quality is good.